Yes, another bulletin on the meaning of ‘LEGALISM’ because it’s the standard argument used by those who refuse to repent. Believer: Jesus commands us to keep His commandments [Luke 6:46; Mat 7:21-29]. Non-Believer: Yeah, but I’m not LEGALISTIC about it. To understand their argument as to why they believe that God is giving them license to sin (if not fully, at least partially) let’s look at how the reasoning goes. That’s not very good bible study. Paul addressed a similar question in his time. In Romans 6:1 he answers a rhetorical question, “shall we continue in sin that grace may abound?” His answer, “certainly not!” This may be why we have thousands of denominations with a nearly equal number of doctrines about how to live. It’s like they’re saying that since there’s a little room to sin regarding salvation, then we can intentionally be mediocre. That’s fine for unimportant things like dieting or quilting, but not a very good way to handle salvation. Is GRACE & MERCY license to sin willfully? That’s just another way of saying “I’m not legalistic about it.” God is full of GRACE & He is MERCIFUL, but that’s no license to sin. The accurate way to look at it is that He has provided GRACE & MERCY to an imperfect people. This is the right way to understand Ephesians 2:8-9 and 1John 1:7-10. God sent His Son as a sacrifice for a sinful people that didn’t deserve it [Rom 5:8-10]. We obey the Gospel upon recognition of our need for the atoning blood of Jesus [2Thess 1:8-9; Acts 2:38; Heb 5:9]. Obeying the gospel & keeping His commandments [Mat 28:18-20] is not being legalistic, it’s being faithful. There are 2 chapters in the New Testament that are telling folks not to be legalistic. They are, Romans 14 & 1Cor 8. These are dealing with issues that are NOT MATTERS OF DOCTRINE but matters of OPINION. 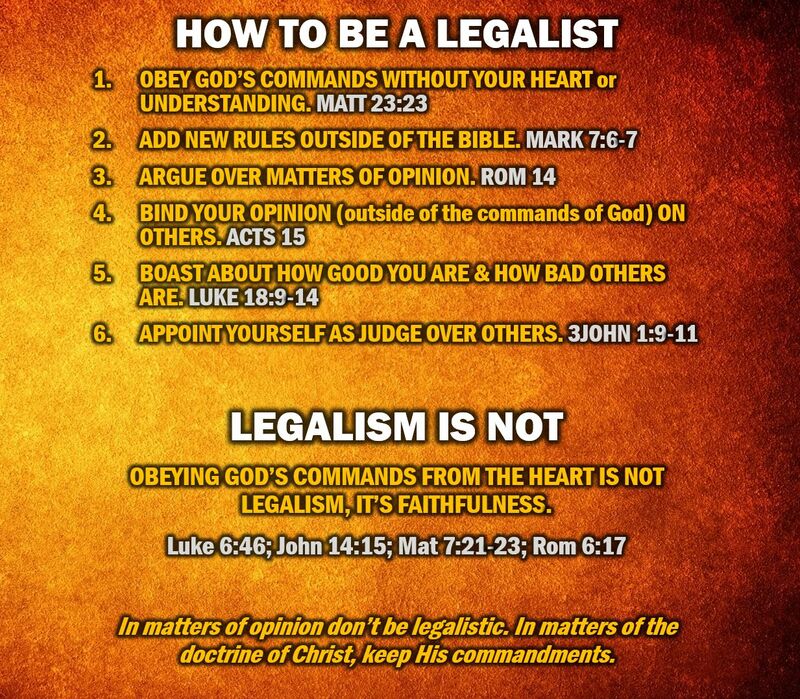 If that’s what you mean by ‘I’m not going to be legalistic about it’ then we both agree with God and His word. If, however, you aren’t going to be legalistic with the doctrine of Christ, then you’re going to find yourself fighting against God. People who say they’re not legalistic about the doctrine of Christ would never say the same thing in other areas of their lives. Below are just a few examples of how ridiculous this sounds. I’m a VEGAN, but I’m not legalistic about it. I love my wife, but I’m not legalistic about it. I always do my job at work, but I’m not legalistic about it. I want a great brain surgeon, but I’m not legalistic about it. I take insulin to keep from dying, but I’m not legalistic about it. I stop at red lights, but I’m not legalistic about it. I watch over my kids when they swim, but I’m not legalistic about it. I’m a bank teller, but I’m not legalistic about it. I’m a judge, but I’m not legalistic about it. I practice food safety at the restaurant I work, but I’m not legalistic about it. I work with the nuclear warheads at Pantex, but I’m not legalistic about it. So you see, we all can understand that in matters of importance we must stand firm. “Watch, stand fast in the faith, be brave, be strong.” [1Cor 16:13] Regarding the matters of style or opinion, don’t be legalistic about it, but with matters of the doctrine of Christ, be LEGALISTIC. The way it is most commonly used is when one person suggests a close adherence to the word of God in the Plan of Salvation, Worship and Godliness that others will claim that person is being PHARISAICAL. It’s a rebuke by someone who ISN’T closely following the Bible against the one who does. Is that a fair use of the word? Does this usage follow with how the Pharisees were practicing Judaism? Let’s examine the Scriptures to see if this is so. Ignoring the commands of God for their traditions. Saying one thing correctly but not doing it. This is called hypocrisy. They bound EXTRA commands on people that God never commanded. SO, WHAT IS PHARISAICAL REALLY? To say that you’re following God but aren’t. To hold to traditions rather than the commands of God. To appear to be righteous but are actually disobedient. God wants us to be saved and to go to heaven. Let’s do that. Has anyone ever challenged you with this statement after telling them to which church you belong? Did you know what to say? When stated this way, you can begin to see the answer to their claims. Jesus has “all authority” [Mat 28:18], and He alone has the right to determine under what conditions salvation is determined. He said that judgment will be based upon the standard of God’s word [John 12:48] and if this is true, are we to teach it accurately? Do any of us have the right to teach less or to add more to His word? Certainly not! If the bible teaches that only those who have been added to the Lord’s church are saved [Acts 2:47], then to teach otherwise is to be a false teacher. To belong to a church not mentioned in the Bible is to disregard God’s word, the word upon which the determination of saved or lost is made. Jesus said; “I will build my church; and the gates of hell shall not prevail against it.” [Mat 16:18] He could have built 1,000 churchES, but He only promised to build ONE. How many bodies (churches) did He build, purchase, is the head of and is the savior of? We read about followers of Christ assembling in local congregations called ‘churches of Christ.’ [Rom 16:16] These are not different denominations teaching different doctrines. These are adherents to God’s word assembling as commanded in their home towns. A word of caution; not every person who attends a “church of Christ” belongs to Him. 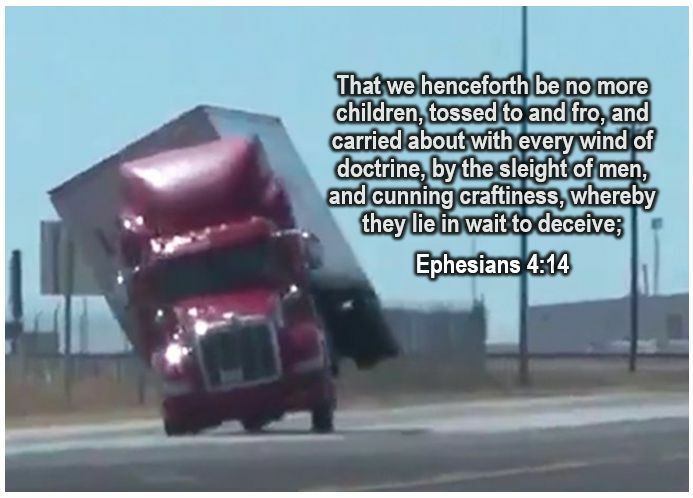 There are some who are in unrepented sin or practicing error. Revelation 2 & 3 also teaches that entire congregations have left their first love, hold the doctrine of Balaam, allow false teachers in, are spiritually dead, and are lukewarm. Jesus said to one congregation, “for I have not found thy works perfect before God.” [Rev 3:2]. They were not completely following God’s word! If those who are in the Lord’s church are in jeopardy for not following His will, what makes you think He’s going to overlook denominational error?! The Reverend Jefferson Davis Tant, duly ordained in the Methodist ministry, became a circuit-rider in North Texas in the year 1880. His work as a Methodist minister was destined to be a short one. In 1881, he moved to Buda, Texas, where in August of that year, he heard W. H. D. Carrington, a minister of the Church of Christ, preach the gospel. He liked what he learned. In those days, the church was often referred to as “Campbellites.” The meeting ran from two weeks to a month. Tant decided to go back and hear what the “Campbellite” preacher had to say further. Carrington took the Bible, read the passages and explained them clearly, especially the verses that told what one must do to be a Christian or to be saved. On August 14, 1881, Tant came forward in Carrington’s meeting and gave the preacher his hand. He was openly weeping as he did so, weeping from fear and from gratitude. J.D. Tant preached all over the nation [abandoning the term reverend]. Gospel preachers were few and far between. He was in great demand, ordinarily receiving more than 200 invitations per year for gospel meetings and debates. His record was 269 invitations in a single year. Obviously, he could not hold more than 20 or 25 of these, since most of them were of two weeks’ duration. J.D. Tant’s last debate with Ben M. Bogard (his eighth) was in the Lone Star community about eight miles east of Greenwood, Arkansas, in the fall of 1937. The proposition being discussed was that baptism of a penitent believer is (or in order to) the remission of past sins. In one of Bogard’s speeches of denial he took up his entire thirty minutes trying to prove that there are two figures (pictures) contemplated in 1Peter 3:21. Insisting that Noah and his family were saved by faith, and then pictured their salvation in the water of the flood, he declared that we are first saved by faith, and then picture that salvation by baptism. He dwelt at length on the fact that one could not have a picture of a thing or a person without first having the substance of the thing or person. He told of having a picture of his mother, and how highly he prized the picture; but he could not have had the picture unless he had first had the mother! His Baptist brethren seemed elated with this argument and felt that it was unanswerable. Tant got to his feet and replied, “My good friends, remember that baptism is just a ‘picture’. Ben Bogard says it is, and since Ben seems to be the big ‘It’ among Baptists, that makes it so. Now, Ben, says baptism is a ‘picture’. That does not help Baptist doctrine at all; for it was Jesus Christ himself who said in Mark 16:16, ‘He that believeth and gets his picture taken shall be saved’. And when Ananias came to Saul of Tarsus there in Damascus, he said unto him as recorded in Acts 22:16, ‘And now why tarriest thou? Arise and get your picture taken, and wash away your sins, calling on the name of the Lord’. There was a roar of laughter from the audience, and Bogard was obviously discomfited as his bit of sophistry was thus handed back to him. Cherry picking is the act of pointing at individual cases or data that seem to confirm a particular position, while ignoring a significant portion of related cases or data that may contradict that position. The practice of cherry-picking overlooks or even suppresses evidence that would lead to a different conclusion. The term comes from the process of harvesting fruit. A picker (such as for cherries) would select only the best-looking fruit while overlooking or wrongly concluding that the remaining fruit is not yet ripe or of a poor quality. It is one of many logical fallacies. When people cite anecdotal evidence, they tend to overlook large amounts of additional data. Selective gathering of evidence to support a personal opinion is misleading and incredibly damaging. 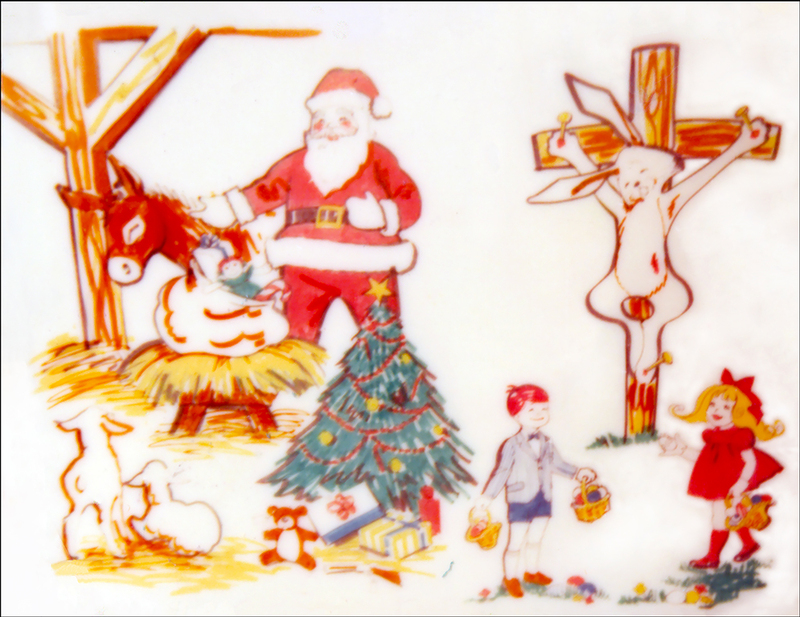 We all know that religious orders cherry-pick the scriptures to prove faith only. Before we go on, you need to know that this article is not going to undo this passage. I hope you believe it and obey it. What we will do is ask the question, is this all that is said about confessing Jesus? Another passage cited by believers only folks is Romans 10:9; “because if thou shalt confess with thy mouth Jesus as Lord, and shalt believe in thy heart that God raised him from the dead, thou shalt be saved:” This proof text is then driven home with verse 13: “Whosoever shall call upon the name of the Lord shall be saved.” They may even include Acts 2:21 which says the same thing. That’s where they stop. They’ll go on to make some grand point about Christs love (He does love you) and how salvation happens at your Lazboy when you begin believing. Saul of Tarsus, when He believed in a risen Jesus, was told what he must do. Ananias came to him and said…“And now why tarriest thou? arise, and be baptized, and wash away thy sins, calling on his name.” [Acts 22:16]. Did you see what happened? When we gathered more information (picked all the fruit) we find out when calling on His name occurs. When we are baptized (buried in water) we are calling on the name of the Lord. We’re all familiar with the ‘BEVERAGE STATION’ found at many eateries. The self-service place one pours their own drink. 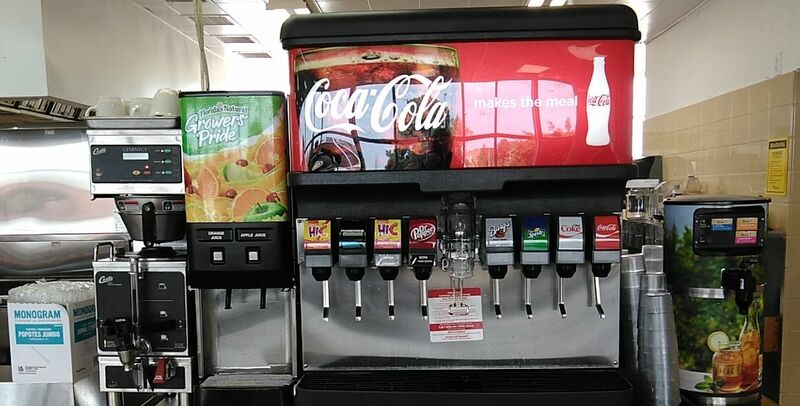 A beverage station is nothing more than a place to get a version of WATER. Jesus is the provider of ‘living water.’ Unfortunately, many find His water unpotable, that’s where the ‘BEVERAGE STATION’ comes into play. For some, they need a little flavor in their water, so to the ‘BEVERAGE STATION’ they go to get tea, coffee or some lemons to ADD a little flavor to their water. Others want a version of water from a major company, these choose Coke, Pepsi or Dr. Pepper (and lines are drawn as to which is better). Still others don’t like any of these flavored waters but despise the taste of regular water. These folks go to the ‘BEVERAGE STATION’ for the filtered water, to TAKE AWAY what they don’t like about the water.